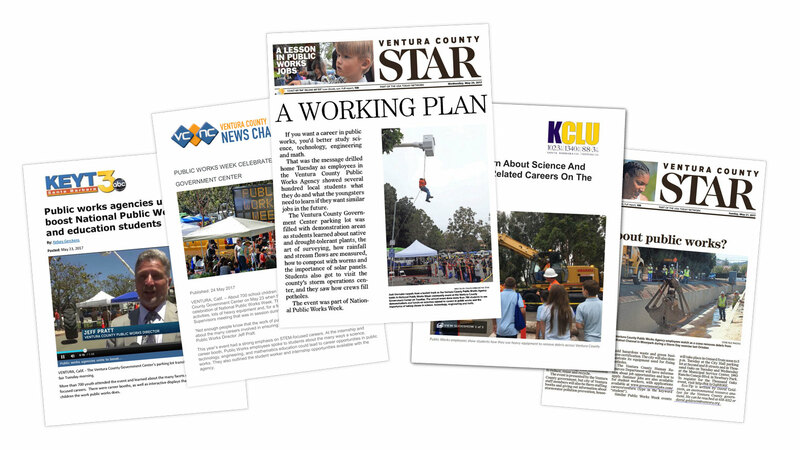 Over the past four years, Consortium Media has taken the lead in developing National Public Works Day, an educational outreach event, for students in the Ventura County community to learn more about Ventura County Public Works Agency. 2017 marked our biggest Public Works Day ever, with over 1,000 attendees and over 50 educational booths and exhibits from the County as well as Ventura County cities. The Government Center's Parking Lot G and VCPWA conference rooms were filled with heavy-equipment demonstrations, interactive displays, and career and informational booths. This event provided a wonderful educational experience for students and the public of all ages, giving them a unique opportunity to connect with VCPWA staff members while learning about a vital organization that is dedicated to providing and sustaining Ventura County’s infrastructure and environment that enhances the safety, health and quality of life for its citizens. CM+PR saw National Public Works Day as an important opportunity for the public to connect with VCPWA. We engage local schools through targeted outreach and have grown attendance at the event from 35 attendees to 550 students, parents and teachers, who were able to tour through over 16 exhibits, including an interactive topography exhibit and career booths. *Paid Advertising Equivalency (PAE) is CM + PR’s method of assigning value to earned media secured for our clients. Earned media consists of press articles and other public relations pieces such as corporate moves, reviews, brand alignments, charity drives and recommendations made in publications or on media platforms not owned by the client or Consortium Media. Such press or public relations pieces are extremely valuable because (1) editorial content cannot be purchased and (2) they carry the implied endorsement of the publication in which they are included. This event was a true joy! My students learned so much and were very excited to attend. I appreciated seeing all the different grade levels and having presentations adapted for us. This was a well-organized event that provided so much more to my students than I could offer in the classroom setting. Thank you for allowing us the opportunity to attend. Copyright © 2019 Consortium Media, Inc.